Today we completed some more team games. The purpose was to build our confidence and social skills, to work with people we haven’t done before and make new friends, to communicate better and to have fun. 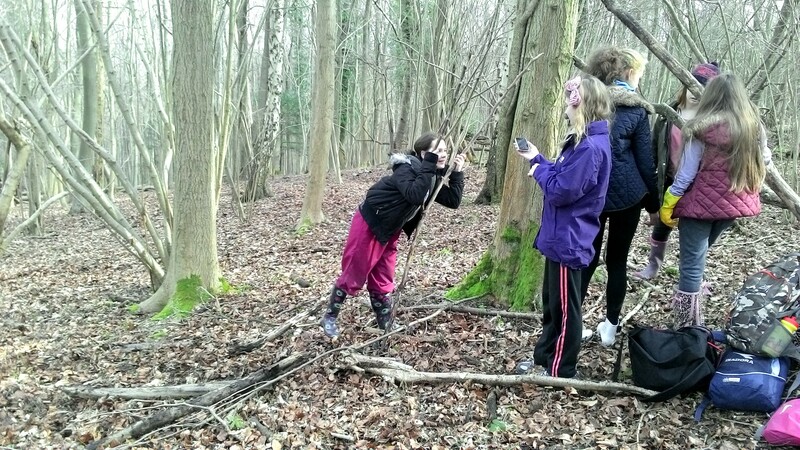 We did lots of different games like orienteering. Today we started with a nice breakfast of pastries and boiled eggs. 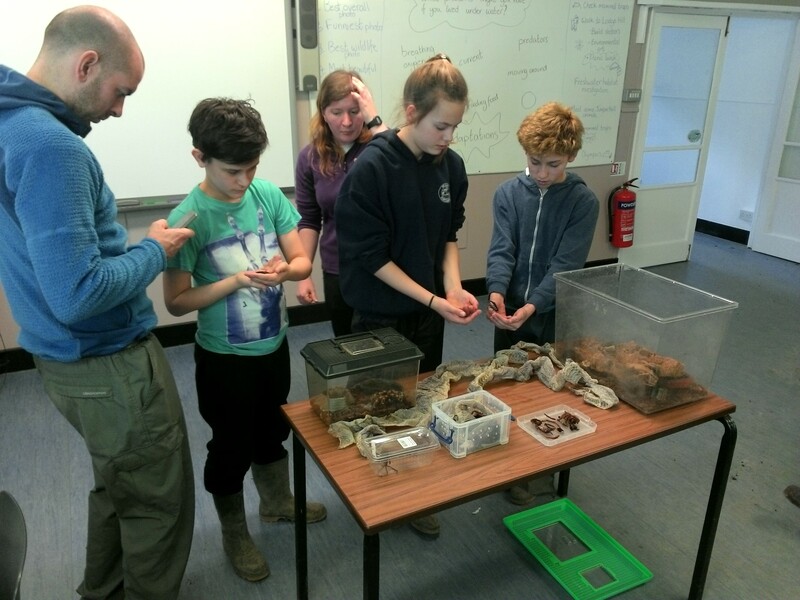 Then we went to check our small mammal traps and feed these then release them. We found some voles and field mice. Then we did team games. Like egg drop challenge, races and orienteering. Lots of fun and learning to work together and communicate. We went and saw the area where we will do our conservation challenge. This is to meet our John Muir award. We will carry on the dead hedge that Priory School started three years ago and will be keeping this up. 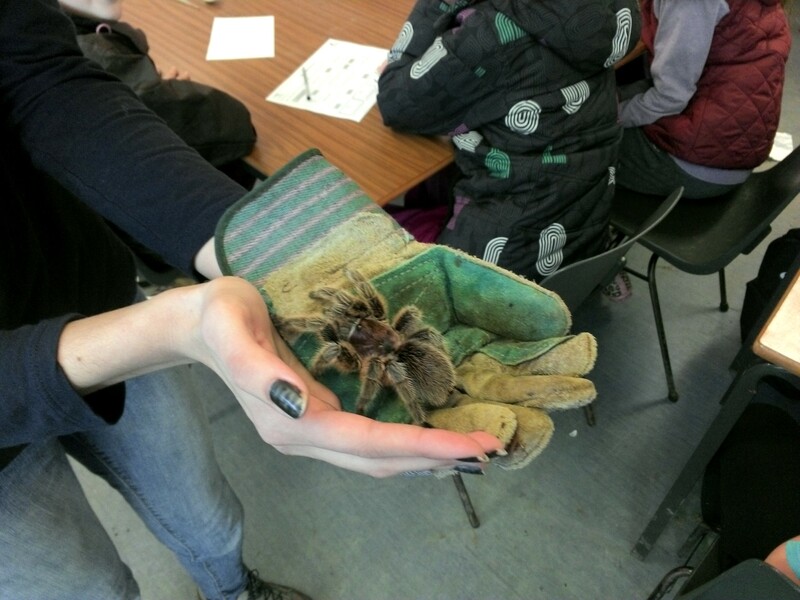 #geographycamp14 Getting up close with scary creatures! 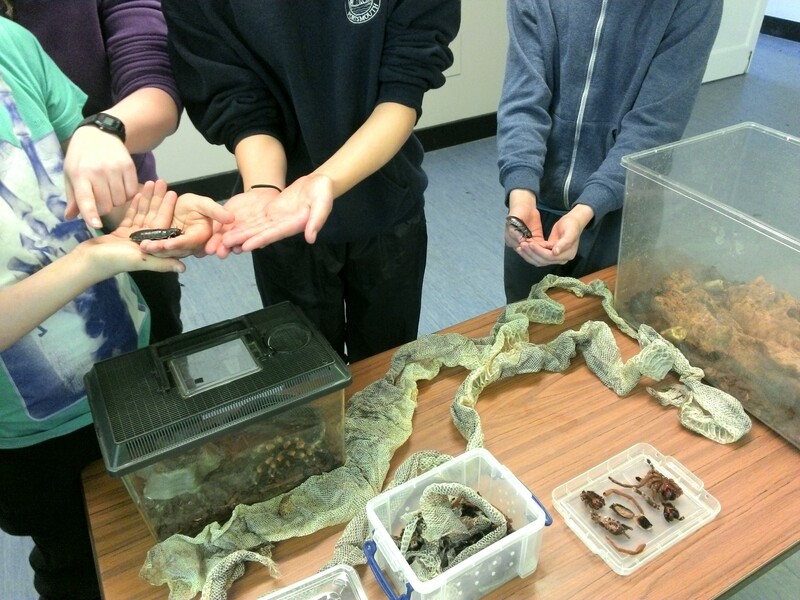 We were able to meet some exotic creatures this afternoon. It was all very interesting and we could choose to have a close look, or a stroke of some creatures like cockroaches and snakes and to see the Chilean spider as it came past. We collected some items to catch invertebrates and pond living creatures. We went to the pond in teams and used nets to fish out the animals. Once we had got some we came back to the classroom and looked at them under microscopes. We found midges, midge larvae, flies and water woodlice. As part of the weekend we are working to gain the John Muir Trust award which is when we learn to discover, explore, conserve and share a place. We are doing this by getting outdoors and by completing Mission: Explore missions. One Mission from the John Muir book is to imagine you are the first discoverer of something. If we had been the first person to discover the midge larvae we would probably have called it a Lightning Spasm Worm because of the way it moves. 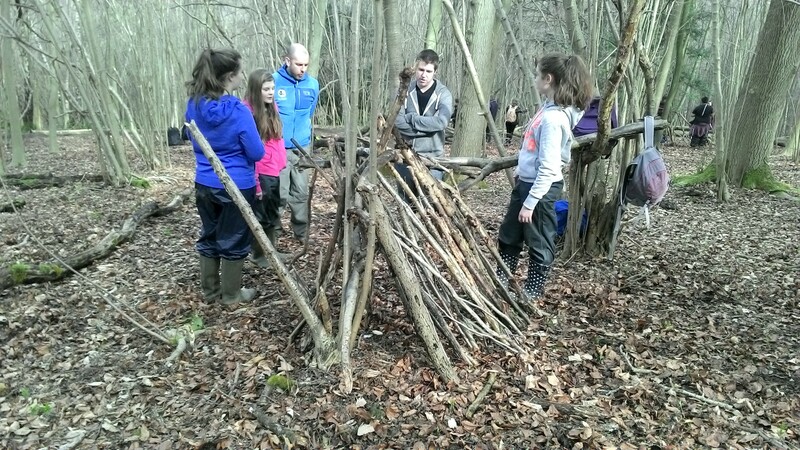 We worked in our teams to create shelters in the woods. Ideally these should be wind and water proof. It was tiring and hard to make them solid and strong. We had to demonstrate our shelter and explain our design. Then we tested them with water! Team Haribo is making a wonderful shelter. We are up in the woods above Juniper Hall building shelters. Like Ray Mears or Bear Grills maybe! This is a challenge because it has to be strong, none of the sticks are the same length, it has to be waterproof and windproof but the wood is soggy from all the heavy rain. Team Dung Beetle say their plan was to build a solid base first, then use sticks against the base then cover with leaves. It’s really fun! crossing the river -victory to the girls! So on the first day we got up to some team building games and exploring. First we looked at what makes a good team member. We all agreed that a good team needs communication, respect, cooperation, listening, decisions, sharing, caring, friendly, fun, hard work. Then we di games like the human knot and crossing the river where we had to work as a team to help each other solve problems. It was great funn and then we realised we don’t always listen as well as we think – and thata this causes chaos! Then we had cake break and enjoyed the common room. We have to keep it clean and neat and what to show we are respectful. 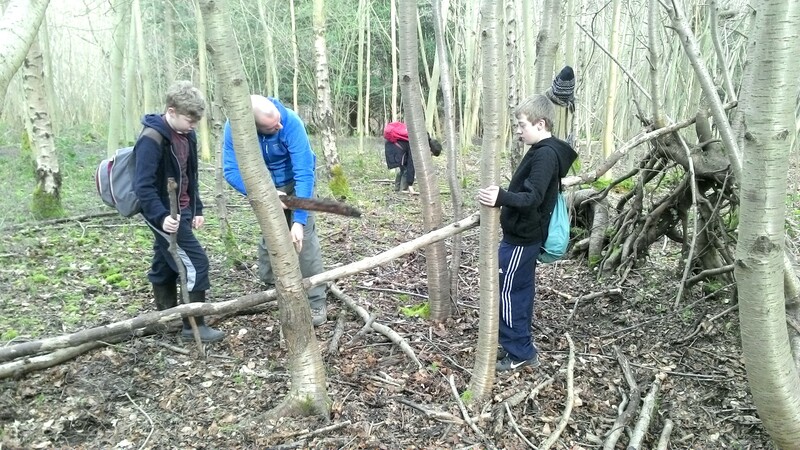 After break we went into the woods to do minibeast hunting. Looking for bugs. We looked under leaf litter, under trees, in the branches, anywhere. We found lots of bugs and looked at them then set them free. Then we went and set our small mammal traps. These are humane traps that don’t hurt animals. We put straw and food inside to give them somewhere warm and snug for the night. then we hid them so no predators like foxes or owls could see. Soon we will see what we caught and then release them. After dinner we wrapped up warm and went on a night hike. It was pitch black! We had torches and also used our night vision. We climbed up Juniper hill. It was exciting and we heard foxes and owls. We sat on the hill and looked at the stars which was so bright compared to Portsmouth. Then we went back to the house and relaxed before bed. Good day! 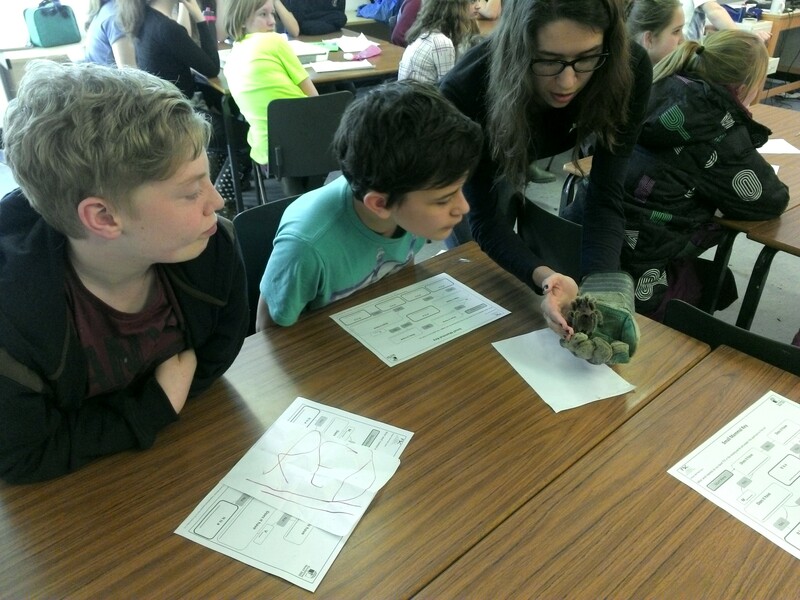 So today was the first day of the year 8 Geography Camp. We set off this morning for Juniper Hall. 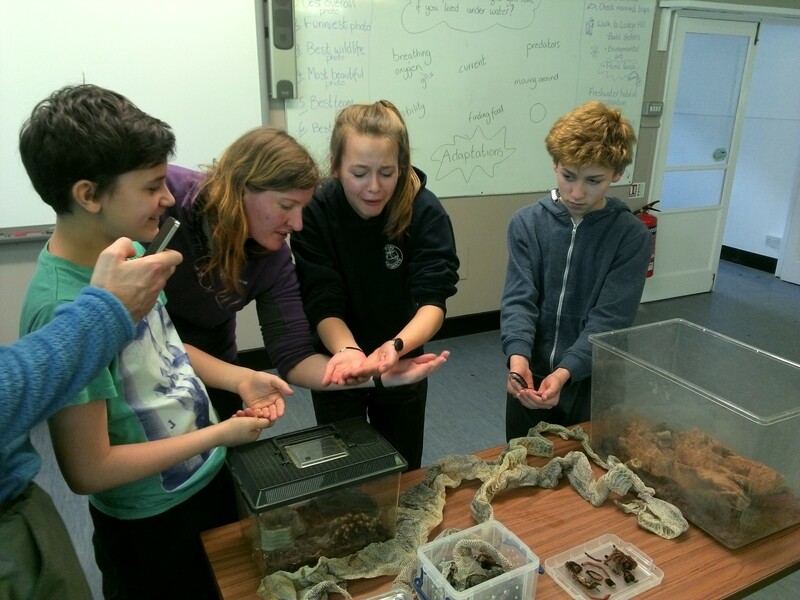 This centre is run by the Field Studies Centre and is in Dorking. We were all really excited to get out of the city and see some countryside. As part of the trip we are working to win a John Muir Trust award which will show that we can discover, explore, conserve and share a wild place. So today was mostly exploring and discovering which was good. We had sunshine as well! And cake.